Few luxury hotel rooms in London can match the fine detail of a May Fair Superior bedroom: each room features deeply textured fabrics, Catalan-designed furniture and a beautiful Sicilian marble bathroom complete with power shower. The May Fair hotel expansive luxury Deluxe bedrooms have all the feaures of the Superior room including king-sized luxury beds and separate power showers. Selected rooms also feature walk-in wardrobes, outdoor terraces and bathroom TVs. All are appointed with Sicilian marble bathrooms. Our beautiful luxury Studio rooms offer all the key features of the superior and deluxe bedrooms and more. 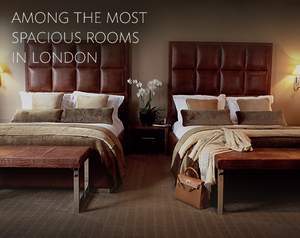 With open plan lounges and full Bang & Olufsen systems, The May Fair’s Studio Rooms are among the most exclusive and sought-after of London hotel rooms. 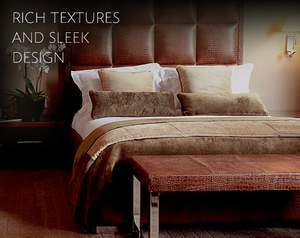 Each has luxury furnishings and fabrics, and a beautifully appointed Sicilian marble bathroom. 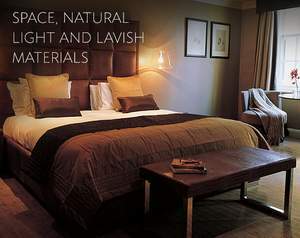 The May Fair hotel luxury Family bedrooms have all the feaures of the Deluxe room but with two queen beds. 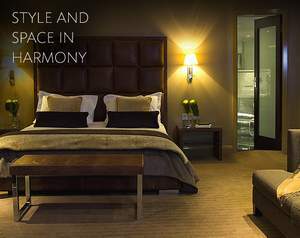 Selected rooms also feature walk-in wardrobes, outdoor terraces and bathroom TVs. All are appointed with Sicilian marble bathrooms. Stay at The May Fair's new hypoallergenic room, dedicated to provide you with the ultimate allergy friendly environment. You can't see germs or allergens - but if you suffer from allergies, you will know when they're present. In a Breatheasy room, we aim to treat every aspect of the room's environment. In your room, the ceilings, walls, doors all surfaces, beds, fabrics and carpets have been treated to protect against all known pollutants and allergens. Hypoallergenic bedding and sensitive non-perfumed environmentally friendly cleaning products are used each day to provide the ultimate in comfort for our customers. A Baccarat chandelier lends instant spectacle to this sought-after space; a bronze lacquered feature wall studded with delicate leaves provides the perfect stylistic compliment making this an inspiring space for cocktails, dancing and dinner or meetings for up to 280. The highly evocative bronze wall makes the Crystal Room a novel setting for your event, with exclusivity enhanced by a private entrance off Berkeley Street. The room also features a specially commissioned Baccarat chandelier; this 6- metre statement piece gives the Crystal Room its unique identity and makes your event utterly memorable. Synchronised LCD projection units, optional lectern and stage area and a built-in audiovisual system make the Crystal Room the ideal setting for meetings, gala dinners and awards nights. The adjacent Palm Beach Casino, accessible directly from the Crystal Room itself, provides a glamorous setting for after-show events or team-building sessions. Seasonal and simple, its provenance quintessentially British, our food is honest and beautifully balanced. The May Fair menus change with the seasons to showcase the finest ingredients as and when they are at their best. Seating 170 for dinner, with the flexibility to be divided into two rooms for conferences, events, smaller meetings and lunches, the Danziger mixes decadent Art Deco style with the latest LCD projection units to deliver a superbly flexible space. Named after the one-time family owners of the May Fair Hotel - Hollywood impresarios, the Danziger brothers. This is a space that whisks guests back to an era of elegant, imaginative style and yet is grounded in its practical use, with easily installed flexible stage for speaker events, conferences or concert performances. Adjacent to The Atrium and in close proximity to private suites 1 to 11, planners can use the Mezzanine level as a truly flexible and contained event space. With a hugely impressive 3m x 2.9m LCD projector screen and built-in speakers backed by dual amp units to ensure reliability, the Danziger provides a hugely stylish presentation space. Additional drop-down screens enable planners to split the room into break-out spaces or accommodate more intimate gatherings, while touch-screen controls and state-of-the-art ceiling speakers ensure that the Audiovisual system is as flexible as the Danziger itself. 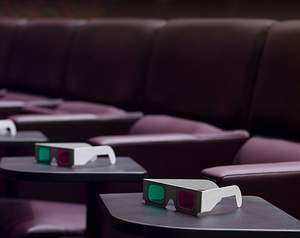 One of the capital’s largest private screening rooms, The May Fair Theatre is also London’s most impressive presentation space, with high-definition projection systems, THX quality spectacular sound, integrated in-seat audience response system, stage and stunning décor throughout. Adjacent to the Amba Salon, it is the perfect space for film, theatre, annual general meetings or launches. The May Fair's screening room is the envy of many cinemas. Audiences of up to 201 guests sit in supreme comfort on Italian-leather trimmed seats complete with armrests and fold out tables, with ample leg room to stretch out. In front of the 8m screen a stage, available with optional speaker's podium, provides an energising and inspiring platform for multimedia presentations. Guests can be entertained pre and post-presentation in The May Fair Bar, from the adjacent Amba Salon, Crystal Room and Danziger Suite or in one of our many private suites. A number of meeting rooms and suites as well as the Screening Room's own Green Room can also be used as preparation spaces where speakers can follow events from the auditorium via live video and audio feeds. Twin cinema and high-definition projection systems, with full cinema sound and superb acoustics ensure the impact of conferences and presentations; state-of-the-art in-seat audience response technology allows for instant interaction and dialogue, and dedicated, on-site technical assistance ensures you make the most of the possibilities with all the help you need. Stunning from ground level to a clear vaulted roof, the dramatic Atrium brings instant space and light to the heart of The May Fair. Glowing with natural light, the Atrium provides a superb meeting space or breakout area in the heart of the hotel. Its location, adjacent to the Danziger Suite and private meeting rooms, and own dedicated bar make it the ideal place to start proceedings. Stunning both day and night, it provides the perfect backdrop for taking a break or evening cocktails. To create a relaxing atmosphere ambient piped music is available throughout the Atrium. As a reception area, technology is kept to a minimum in this space. However, if required PA systems and plasma screens can be hired in order to customise the Atrium with your own signage and visuals. Tucked into a private corner of the hotel, this room has an intimate atmosphere making it ideal for private dining, meeting or reception space. Set away from the hustle of the hotel and linked to the Amba Bar, this room is utterly private, the perfect space for cocktail parties, private dining and smaller events. The Amba Salon has its own private entrance to The May Fair Theatre, which is equipped with state-of-the-art audience interaction, THX certified sound and a high-definition projection system. The space itself is equipped with an LCD projector and screen. The Amba Salon is flexible and can hold 50 people board room style, 70 people for dinner and 120 people for a reception. 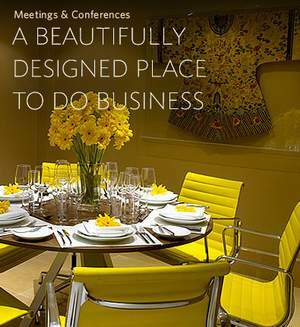 Discreet, stylish, superbly equipped and with the majority of rooms providing natural daylight: there is no better business meeting venue in central London. Meeting facilities are grouped around an airy break-out area, with state-of-the-art presentation technology in each meeting room, on-site technical assistance and advice, and complimentary high-speed wireless internet access throughout. Enjoy freshly brewed tea and coffee and freshly squeezed orange juice on arrival, during your mid-morning and mid-afternoon breaks alongside an array of Pastry Chef Rana Maqbool's homemade treats including traditional English tea time treats of scones, clotted cream and preserves, hot from the oven muffins, thirst-quenching milkshakes and fruit smoothies, sliced exotic fruit and chocoholic’s delights. Executive Chef, Bert Muhle’s bespoke gourmet lunch served with garden-fresh, crisp, tossed salads, speciality breads from around the world filled with a selection of appetising options, taste bud teasing international main courses to tantalise your palates including rich Indian dishes, European feasts, authentic Asian eats and good old traditional British grub, ending your gourmet experience with luscious homemade desserts. Hire of the main meeting room. Stationery box and The May Fair blotters, paper, pencils, sweets and crisp, juicy apples in the meeting room. Dedicated Event’s Executive to co-ordinate all of your pre-event requirements and a dedicated Event Manager to look after all your needs on the day. Complimentary high-speed wireless Internet access throughout the meetings area, allowing for flexible working across a versatile range of business meeting spaces. Fresh, seasonal produce sourced from the best local suppliers in Britain, provides the basis for our supremely flexible on-site catering menus, adding a touch of quality and character to any business meeting. Choose from a variety of business breakfast, lunch and dinner options, which can be served at your convenience in our meeting rooms. Hotel guests are invited to use the wet spa and relaxation facilities by purchasing a day pass for £15. Guests who are not staying at the hotel are also very welcome to use the same facilities by purchasing a day pass for £30, however if you are having a treatment at the spa these facilities are included in the treatment price. All guests are invited to arrive up to one hour before their treatment time to enjoy full access to our wet spa facilities. Unwind in the Relaxation Room before you sample the deep cleansing of the Herbal Sauna and Aromatic Steam Room. Finish off under the Three Experience shower, including Forest Mist setting to prepare body and soul for your treatment. All of The May Fair Spa therapists are highly trained and knowledgeable, each gaining a well deserved reputation for attention to detail and ability to leave their guests feeling rejuvenated. This especially applies to lead therapist Asa Klasson who has quickly become one of London's most sought-after therapists thanks to her passion and expertise in all aspects of wellbeing massage and treatments. Unfortunately there is no access to The May Fair Spa and gym for persons under the age of 16 unless they are chaperoned by a parent or legal guardian. 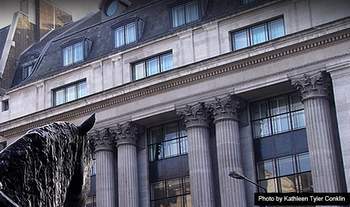 The May Fair Spa Hotel, London offers the ultimate in spa packages to create the most lavish day of all. What makes us unique is that we take great care in providing the right treatments for every individual, so that you will be really delighted with the results. We have also paid great attention to every detail and offer full use of our spa facilities to ensure your spa experience really is the most luxurious treat. Our spa packages are the ideal gift solution for that special someone, and our comprehensive selection of spa packages present you with the best treamtent options, to satisfy even the most demanding spa goer. All spa packages, as well as individual treatments, can be bought as gift vouchers, and come beautifully presented, ready to suprise and delight. Heady and intoxicating this potent concoction combines the deep essence of frangipani with the more subtle tones of the lotus flower for a perfectly indulgent experience traditionally reserved only for royalty. Body wrap with intensive full body scrub and hot oil scalp treatment. The most decadent way to detoxify the body, this package is aimed at draining, toning and energising using fresh natural frangrances of green mint tea and ginger. Buy a gift voucher for this treatment. Combining two of our most sought after treatments, this package offers the ideal total body treat. Enjoy all the benefits and results of your personally tailored facial before being drizzled in warm oil for a divinely relaxing Swedish massage. Designed to revive even the weariest traveller, this spa package will boost mind and body leaving you feeling ready to face the world again. The unique combination of treatments will reverse the negative effects of long haul flying in a high altitude atmosphere, especially the Biomorphose Facial which targets dehydration, bringing your skin back to a radiant glow, while mud wraps work on puffy aching legs, the neck shoulder and scalp. Everything about this spa package is designed for those seeking a complete head to toe detoxification experience. Right from the start, your body will be cleansed and smoothed with the algae seaweed peel, before you are enveloped in a warm seaweed mud, which encourages toxins to be released from your body. This body wrap is complimented by the stimulating benefits of our Hot Stone Massage. The package would not be complete without the purifying and rebalancing effects of our Ultimate Deep Cleanse Facial. Take pleasure in sharing the ultimate spa experience with someone special. Whether it be your partner or your best friend, you can indulge your bodies with mineralising muds and salts in the unique Cleopatra Bathing Experience designed for two, followed by a luxurious massage in our exclusive couples treatment room. Finally, allow yourselves to be guided back to our relaxation room to enjoy a chilled glass of champagne complimented with succulent fresh strawberries. Melt away muscular tension with our intensive hot stone massage before having your back cleansed and purified. This package is complimented with a Reviver Facial to boost and rejuvinate any skin type. Although originally designed especially for men, it has become a popular choice for women too. Further treatments can be found in our For Men section.